Kenai Peninsula, Alaska – Mountain Rider’s Alliance has launched a website, www.SkiManitobaMountain.com, detailing their plan to develop what the group is terming a low impact ski area on the Kenai Peninsula of Alaska. Project manager Dave Scanlan recently concluded seven community outreach presentations. “The project was generally well received by the local communities. We appreciate everyone taking the time to join us as well as their informative feedback. We will be implementing the information gained into our master plan,” said Scanlan. Scanlan and members of the MRA have already met with corresponding governmental agencies where a road map through the permitting process was outlined. MRA expects to submit a formal application in October 2011. While the group touts that the resort’s three surface lifts “will access 10,000 acres of legendary Chugach terrain,” that figure includes all terrain accessible within a two-hour hike from the lifts. Mountain Rider’s Alliance founder Jamie Schectman hasn’t directly stated what acreage would be directly accessible from the lifts but an MRA spokesperson has since estimated in-bounds controlled terrain at 1,000 acres. 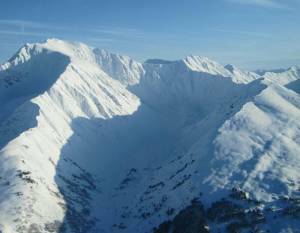 Manitoba Mountain is situated at Mile 49 on the Seward Highway, 90 minutes from Anchorage at the site of the former Manitoba Ski Area and the Glacier Ski Lodge that operated from 1941 to 1959. Manitoba Ski Area is Mountain Rider’s Alliance’s pilot project that’s designed to be small on infrastructure. Renewable energy options to power the project, including micro-hydro and wind, are being evaluated, the group indicates.